When you hear your phone buzz with a new text message when you’re behind the wheel, it’s unnerving knowing you can’t check it. The world has become super-connected and Honda knows it. 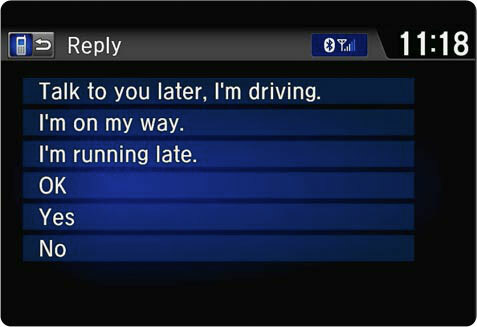 We’ve told you about our Multi-Information Display (i-MID) that reads your text messages out loud while you’re driving. Using your smartphone and Bluetooth connectivity, you’ll also see an alert on the i-MID on in-dash navigation screen when you receive a text message. You can than use your steering wheel controls to choose to listen to your messages over the audio system and then select a reply with one of six pre-written responses. That means you can legally check our messages the second you receive them while driving — without ever touching your phone! If you’d like to learn more about Honda’s Safety Initiative, click here.